Every evening at sunset, over 220 state-of-the-art LED lighting fixtures illuminate City Hall’s exterior. Normally, a soft white glow shows off the play of light and shadow on the full façade and dome. Frequently, special plaza façade lighting schemes honor or celebrate events, seasons, and holidays. 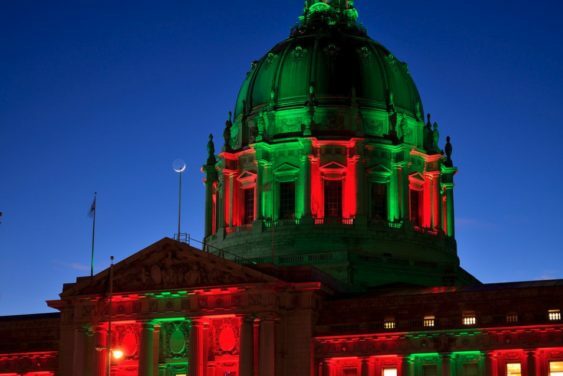 City Hall will be lit up in green and red most nights in the lead up to Christmas and immediately afterward. The schedule is always tentative for the holiday lights and subject to change when there are special events and the building is lit in honor of those.